Chocolate come from cocoa beans, namely the inside of the cacao pod. Cacao is a fruit. 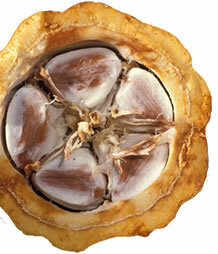 The name of the fruit is "Cacao pods", or officially "Theobroma Cacao". As you may know, "theobroma" means "food of the gods". After processing, we talk about "cocoa" rather than "cacao", and this is used to make chocolate and products such as cocoa powder and chocolate nibs. All the chocolate we eat starts out as cacao pods growing in regions near the Equator.